It’s that time of year again. We’ve moved our clocks forward, we’ve opened up the curtains and maybe are doing a bit of spring cleaning. Well, there is one thing that the season wouldn’t be complete without, and that is wine! Nothing breaks in spring like enjoying a glass of white wine while sitting on your porch or at the lake. 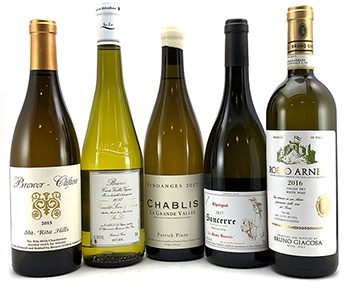 Here are some white wines to kick start your spring! 2015 Brewer-Clifton Chardonnay Santa Rita Hills - This springtime favorite at Sokolin with its notes of buttered citrus rind, candied lemons and honeycomb is a refreshing splash on a warm day. It took three different vineyards to make up this blend and only one glass to fall in love with it. It has a 95 point score and is priced at only $26.95, delivering tremendous quality for the money. 2017 Pepiere Muscadet Sevre et Maine Sur Lie Clos des Briords Cuvee - This wine has a long name and a big taste, and it’s only $17.95! The Muscadet region is right along the Atlantic coast, and it literally seems like you can taste the salty air when you sip a bright, mineral Muscadet. This wine boasts a rich and concentrated backdrop of ripe fruity flavor with a mix of spring flowers! Take it to the lake or ocean to enjoy on a weekend outing. It makes a perfect pairing with seafood like mussels and oysters to enjoy while sitting by the water. 2017 Patrick Piuze Chablis La Grande Vallee - Patrick Piuze is the new guard in Chablis, and even if you haven’t heard of him, his wines are shockingly great. Some of the Grand Crus come close to the legendary producer JF Raveneau at a fraction of the price. And the Premier Crus are gorgeous and are way underpriced, for now. His wines are very small production, so grab them while you can. This Chablis has a great balance of peaches and hazelnuts giving just a hint of sweet. Sometimes the simplest tastes are the most delicious. 2017 Thomas-Labaille Sancerre Les Monts Damnes - If you’re looking for a unique flavor, this one is it! With its combination of gooseberry, lime peel, and tart orange, it is a roller coaster for your taste buds. It’s a light wine with a wonderful acid balance and is drinking well now. Pair with a dinner of chicken confit, artichokes and a freshly baked baguette. Priced at just $26.99 and 94 points. For a great grilled chicken recipe to try with these wines, here is our recipe for Sweet Lemongrass Chicken! Process lemongrass, shallot, garlic, lime juice, fish sauce, brown sugar, and red pepper flakes in a food processor to a fine paste. Season chicken with salt and pepper and place in a re-sealable plastic bag. Add lemongrass mixture; chill at least 30 minutes. Heat oil in a large skillet over medium-high. Remove chicken from marinade, scraping off excess, and cook until golden brown, 6–8 minutes; turn and cook until cooked through, about 2 minutes longer. Serve chicken with lime wedges for squeezing over. NOTES: *Lemongrass can be found in the produce section of your grocery store. If your grocery store doesn’t have it, then specialty stores such as Sprouts and Whole Foods will carry it. If you can’t find it, make sure you ask someone! To prepare lemongrass, remove outer tough layers until you reach layers where the bottom of the stalk is white and soft. Chop white bottom section of lemongrass up until it gets tough – about the bottom third of the lemongrass stalk. 2 stalks of lemongrass should yield approximately 3 tablespoons.